To cope with the grief, John wanted to pay a tribute to Diana. After initial failed attempts to rework "Step Into Christmas" as "Death of a Princess", he contacted his songwriting partner Bernie Taupin, asking him to revise the lyrics of their 1973 song "Candle in the Wind" to honour her. George Martin was contacted to help produce the song, and added a string quartet (Peter Manning, Keith Pascoe, Levine Andrade, and Andrew Shulman), and woodwind (Pippa Davies, oboe) to help balance the recording. It was recorded at Townhouse Studios in West London. ^ a b c d e Doyle, Jack (26 April 2008). "Candle in the Wind, 1973 & 1997". PopHistoryDig.com. Retrieved 14 February 2014. ^ "Elton John Chart History (Canadian Digital Songs)". Billboard. Retrieved 14 February 2019. ^ "Hits of the World: Denmark". Billboard. Nielsen Business Media: 61. 11 October 1997. Retrieved 14 February 2014. 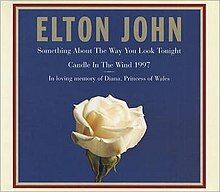 ^ "IFPI - Elton John: Something About The Way You Look Tonight/Candle In The Wind '97". Suomen virallinen lista. Suomen virallinen lista. October 1997. Retrieved 2 November 2016. ^ a b "Hit Parade Italia – Top Annuali Single: 1997" (in Italian). Hit Parade Italia. Retrieved 3 August 2015. ^ "Hits 1997 Österreich – Single-Charts" (in German). Chartsurfer.de. Retrieved 3 August 2015. ^ "ULTRATOP BELGIAN CHARTS (1997)". Ultratop (in Dutch). Ultratop.be. Retrieved 3 August 2015. ^ "ULTRATOP BELGIAN CHARTS (1997)". Ultratop (in French). Ultratop.be. Retrieved 3 August 2015. ^ "Hits 1997 Finnland – Single-Charts" (in German). Chartsurfer.de. Retrieved 3 August 2015. ^ "Top 100 Single – Jahrescharts". GfK Entertainment (in German). offiziellecharts.de. Retrieved 15 July 2015. ^ "Top Selling Singles of 1997". The Official New Zealand Music Chart. Retrieved 3 August 2015. ^ "Hits 1997 Norwegen – Single-Charts" (in German). Chartsurfer.de. Retrieved 3 August 2015. ^ "Romanian Top 100: Top of the Year 1997" (in Romanian). Romanian Top 100. Archived from the original on 22 September 2005. Retrieved 19 September 2017. ^ "Hits 1997 Schweiz – Single-Charts" (in German). Chartsurfer.de. Retrieved 3 August 2015. ^ "Hits 1998 Österreich – Single-Charts" (in German). Chartsurfer.de. Retrieved 3 August 2015. ^ "Hits 1998 Finnland – Single-Charts" (in German). Chartsurfer.de. Retrieved 3 August 2015. ^ "Hits 1998 Norwegen – Single-Charts" (in German). Chartsurfer.de. Retrieved 3 August 2015. ^ "Hits 1998 Schweiz – Single-Charts" (in German). Chartsurfer.de. Retrieved 3 August 2015. ^ "Hits 1998 UK – Single-Charts" (in German). Chartsurfer.de. Retrieved 3 August 2015. ^ Geoff Mayfield (25 December 1999). 1999 The Year in Music Totally '90s: Diary of a Decade - The listing of Top Pop Albums of the '90s & Hot 100 Singles of the '90s. Billboard. Retrieved 15 October 2010. ^ "The Billboard Hot 100 All-Time Top Songs (50-41)". Nielsen Business Media, Inc. Retrieved 1 August 2018. ^ "Latest Gold / Platinum Singles". Radioscope. 17 July 2011. Archived from the original on 24 July 2011. Retrieved 2 July 2011.